Boonstra Transport has been working with our ImageCapture software since 2006. Initially, they processed bills of lading, but since 2011 they have also been using ImageCapture for the automated processing of their purchase invoices. Ron Langeveld, Controller at Boonstra Transport, talks about his experience with the software and with Scan Sys. Boonstra Transport is a third generation family business that has been working in the transport sector since the 1920s. Related to cattle trading in the early days, with the Boonstra family providing the transport. Over the years, the emphasis of the business shifted more and more towards the transport activities. In the meantime, the organisation has grown into a sizeable company, with 110 units on the road, and over 150 employees. Situated in the north of the Netherlands, the company has a large and dense distribution network across the Benelux and Western Europe, including 24 hour delivery and home delivery, among many other options. Boonstra transports all kinds of products, ranging from commodities, machines, flowers and plants to live poultry. Being an innovative company, it uses modern, ultralight vehicles that not only can be fully laden, but are also suitable for many different types of loads such as pallets, long lengths of aluminium and sheets of concrete. In addition, Boonstra has had multi-functional containers developed for loading and unloading both commodities and semi-finished products. These are lightweight containers and have various loading options which enable the transportation of larger equipment or freight with unusual dimensions. By using these containers, it becomes unnecessary to use different types of vehicles for different types of loads. 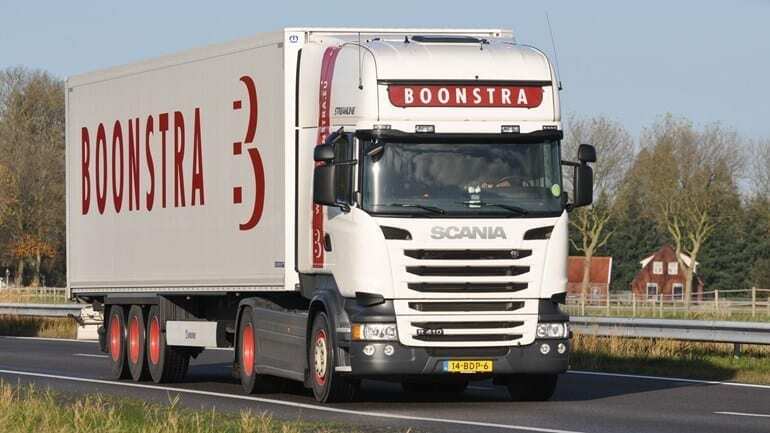 Boonstra has a number of specialisations where it is market leader, including the transport of aluminium within Europe, and providing transport for the horticultural sector. In the area of warehousing, Boonstra also offers a variety of options for storage, and warehousing activities such as packaging and repackaging and labelling. Overall, Boonstra has over 7,500 m2 of storage areas available, of which a large part can provide heated storage options. As a company you can’t stand still. Now we are busy setting up and providing secure transport that complies with TAPA guidelines. (ed. TAPA provides certification for secure transport, comparable to ISO in terms of stringency and regulation). Unfortunately, in the last few years the world of transport has seen a growth in the number of cases of theft. That is why we now have rolling stock that protects against it, and that we can offer as secure transport and services. Not just the hardware has extra security, but software is also used, for example, to monitor the route taken by the transport from end to end. All aimed at ensuring the safety of our customers’ goods and our own staff. The aim is to achieve the highest level of TAPA certification, so that we can also differentiate ourselves through this on the market. The company has a strong focus on CSR, or as Boonstra refers to it: Environment, Safety and Good business. For example, we try to ensure our fleet meets the highest level of Euro environmental standards, and when investing in vehicles we take into account their long term environmental impact. By making use of innovative products such as lightweight containers, the number of “empty kilometres” is pushed down, resulting in lower CO2 emissions. Boonstra was one of the first companies with its own filling station where you could fill up with AdBlue as well as diesel (AdBlue is an additive that makes for cleaner driving with diesel). Something different, and future-oriented, is the heating of warehouses, which is done using geothermal heat, making all the warehouse heating CO2 neutral. The new warehouses are also being equipped with solar thermal collectors. The well-being and health of employees is an important issue for Boonstra. Vehicle technologies are installed, such as monitors of the distance to the vehicle in front and cameras for blind spots, to provide greater safety while driving. Working conditions and the health of employees both on the road and in the office are carefully monitored. Boonstra also invests in the development of its employees by providing training opportunities. The management is the third generation of Boonstras and transport is in their blood. They grew up surrounded by this business from a young age, and know the organisation and the market better than anyone. That illustrates perfectly the strength of a family business; management that is passionate and involved, creating mutual commitment and inspiring customer confidence. Boonstra has a strong vision when it comes to investment in quality with an eye on the future. Some investments, for example in modern equipment, may have seemed at the time to be a risky choice when the transport sector was in the doldrums. By holding fast their vision, the organisation has not only managed to stay afloat, but over the last few years the company has not stopped growing. Investment is a must in this sector. Investment in equipment is one thing, but investing in ICT, for many organisations, is a more tricky subject. Luckily, this company sees things differently; you also need to invest in the tools to make sure that processes run more efficiently. That has brought us big benefits. For example, in a few years we grew to have one hundred and ten vehicles without us having really noticed much here in the office. We were able to accomplish more work with the same number of people, by being efficient in our processes. In the end, we had a natural wastage (employees who retired) and covered them in the office by using automation. This meant a reduction in staff of 40%. The growth of the company was the reason why they went looking for a scan solution. Every week they received over one thousand orders with different freight documents, such as CMRs, packing vouchers and transport orders. Simply finding things manually cost a huge amount of time. In addition, all these documents had to be filed and stored and the archives were bursting at the seams. The TMS (Transport Management System) at the time was no longer able to meet the requirements of the endlessly growing organisation, so they set out to find a new TMS system and a scan solution that integrated with it. At that time, Boonstra Transport was receiving around 1,500 orders per week. The orders often consist of several order lines, and each order creates a freight document that needs to be processed by our administration. It happened more frequently that all the transport documents still needed to be tidied up in the evening. The filing cabinets for storing everything were full within six months and then the folders had to be moved on to the archives. Something needed to be done. With digitalisation, the invoicing process could also be speeded up. The combination of reducing the amount of work and speeding up the invoicing process were the most important reasons for starting to digitalise the processes. Finally, they chose Transpas, the TMS system from ArtSystems, combined with ImageCapture for Documents software for the digitalisation of their freight documents. A few years later, Boonstra also started working with Exact Globe and Synergy as their financial application, and they are also using ImageCapture for Invoices for the automatic processing of their invoices in Exact Globe, with a connection to an approval workflow in Exact Synergy. Every year, Boonstra processes around 8,000 invoices which are partly purchase related invoices, and partly overhead invoices. We take our time to make decisions. This means that we rarely regret any of them. So far, we have not regretted for one moment our choice of a scan solution from Scan Sys nor our Transpas TMS system. The reason that we opted for Scan Sys is that Scan Sys’ vision lines up with our own, which is the improvement and automation of the process instead of a hardware-based solution. The bills of lading are processed using ImageCapture; the process starts with the incoming orders. The orders are assigned to different routes in Transpas by the planners. A so-called route plan is created that is passed to the driver. A barcode is printed on the list with the route number, registration number and driver number. At the end of the route, the driver hands in his documents and these are scanned with the help of the barcode. The route number is recognized immediately in ImageCapture, using the barcode. This means that the freight documents are automatically linked to the right file in Transpas. If unattached freight documents have to be scanned, ImageCapture will first propose a selection of transactions that are currently still open in Transpas. So there is no need to search through all the transactions, which saves a lot of time during the processing. The freight documents can be queried digitally from within Transpas. Thanks to the rapid handling and processing of transport documents, the invoicing process that follows has been made much faster. The CMR notes are automatically included in the digital mailing, along with the sales invoice. We issue a large number of the CMR notes ourselves. We print a barcode on them and they go through the scanner, then they are directly recognized and linked in ImageCapture. We also receive bills of lading that are written out by the driver while on the road, for example because someone asks him to collect a load when he is already on his way. If we had to go searching for all these unconnected documents in our database and also had to link them to the right file, we would be wasting a great deal of time. That is why the software has the option of highly targeted searches and only offers orders for selection that relate to that route and which therefore could be relevant. Boonstra receives two kinds of invoices; overhead invoices such as fuel, phone and electricity, and the purchase invoices or charter invoices from external transporters. Prices are agreed in advance with external transporters and are recorded in the Transpas transaction. The purchase invoices are recognised in ImageCapture and linked to the transporter. Then ImageCapture uploads the associated transaction rules from Transpas and compares the prices agreed in advance with the amounts on the invoice. If the invoice matches the data in Transpas, it can be approved for booking, and is automatically created in Transpas. From Transpas, the entry is exported to the back-office financial application, Exact Globe. The transporter quotes a route number on his invoice. Based on this, the software can tell which data needs to be collected from Transpas. The invoice is compared with the order rules in Transpas, and if it matches these, the invoice is booked in Transpas and exported to Exact. Once the invoice and the order have been reconciled, this means that they can not be booked more than once by mistake. The overhead invoices are linked in ImageCapture to the right creditor, after which, based on the master data in Transpas, an automatic entry proposal can be generated, with the general ledger account code, cost centre and description of the invoice. At this step, the register is also selected to decide which people need to approve the invoice in Exact Synergy, and in what sequence this needs to be done. The booking is then passed on to Transpas and Exact Globe. The entry is made in Exact as blocked for payment in the IIR (incoming invoice register), after which Exact Synergy automatically starts the approval workflow. Once the invoice has been approved, the booking is unblocked in Exact and included in the purchase register. We have seen the greatest win in the automatic processing of our transport documents, but our creditor management team is also very content with the process automation. Previously they had to pick up the invoices and go to the warehouse and to different offices to get them approved. Then the invoice was initialled and it was placed in a folder. A few weeks later the invoice was taken back out of the folder in order to pay it. The traceability of the financial processing especially is much improved nowadays. Currently, we don’t even need to look at it any longer. We just run the payment proposal list and there are all the invoices that are approved in a neat list. Scan Sys is a great partner to do business with! They put themselves in the customer’s shoes. Instead of using their own product as reference point, they try to match the customers wishes as closely as possible to their product.